The alternator generates the electrical power to the car battery to power a cars electrical system. 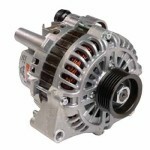 The Alternator is rotated by a serpentine belt that utilizes the circular movement of the engine crankshaft. This rotation winds a coil made of an iron core and copper winding on a rotor to generates electrical power. Some common symptom of wearing or failing alternator are; Battery warning lights, car not starting, the engine stalls while driving due to loss of electrical power, dimming of the lights and dashboard or a winding noise while driving. It’s important to eliminate other electrical power supply problems such as batteries, cables and fuses that may be affecting the alternator’s performance. An example would be a bad battery or battery cables may effect an alternator test. At our North Attleborough auto repair center alternator service is quick, easy, and affordable. Our mechanics check the alternators power output and the entire starting and charging system to find the exact problem before replacing the alternator.